As the new president of the Asia-Pacific division of GE Industrial Security, a subsidiary of General Electric Co., Tammee L. Thompson is responsible for all operations in the region, which includes China, India, Korea, Japan and Australia. She joined GE in 1999 and became the first African-American woman to make a presentation to the company?s board of directors, as well as one of five African-American women to be ranked among its top 600 executives. Thompson has a master?s degree in business administration from Stanford University and a bachelor?s degree in economics from Georgetown University. Prior to joining GE, she held such high-level positions as director of the marketing division at ITT Corp. and senior consultant to the National Strategic Planning Group at Ernst & Young, LLP. 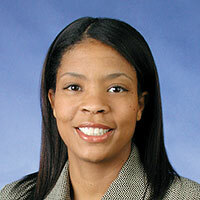 Thompson also has worked at Morgan Stanley & Co. Inc. and at The Boston Consulting Group. Despite the hectic nature of her career, Thompson volunteers with and contributes to child advocacy organizations such as World Vision, Youth Outreach Services and Court Appointed Special Advocates. She is also a leader of GE?s African-American Forum and serves as a mentor for several of GE?s African-American employees. She is especially interested in youth services. ?So many young people get caught in the cycle of poverty and poor education because they do not have accessible role models to help them see how large their lives could be,? she says. Thompson credits her parents with giving her the ability to dream and not see boundaries. She points to their high expectations and personal sacrifices as major reasons for her professional success. At the same time, the tragedy of her father?s passing has grounded Thompson and helped her recognize that her family?s love and support remain important. A devout Christian, she believes there is a purpose to life that is even greater than her career. She therefore adheres to the words that encourage individuals ?to embrace opportunities as they have been presented,? found in the biblical passage of Proverbs 3:5?8.